Rock Butte is hard to find labeled on topo maps, but can be located as the high point on the Rock Butte Trail that connects to a point on the Pine Ridge Trail about midway between the Coffee Mill and East Ash trailheads. Rock Butte is more like a minor ridge system than it is like a peak. It's hard to find the true highpoint since it branches out on a nearly-level summit. But it does give climbers a number of options for getting to the top and exploring. To get to the Roberts Trailhead, the best route may be to travel west from Chadron on Highway 20 about 4 miles to Deadhorse Road. Go south on Deadhorse about 6 miles to Grantham Road. Go west 1 mile, then south 1 mile, then west 2 miles on Dry Creek Road, then south 1 mile, then east 2 miles on Faulk Road, then south 2 miles on Elleson Road. At the junction of Faulk Road and Bethel Road, you will see Bethel Church. Turn east there and travel about 1 3/4 miles to the Roberts Trailhead. At the trailhead, you will see a corral, a large parking area, a camping area, and a vault toilet. The trailhead sign is by the corral. From the corral, you will have to hike about 1 mile to a trail junction sign. The Roberts Trail goes east to a junction with the Pine Ridge Trail, while the Rock Butte Trail goes west, with a slow, steady ascent that ends at the summit. 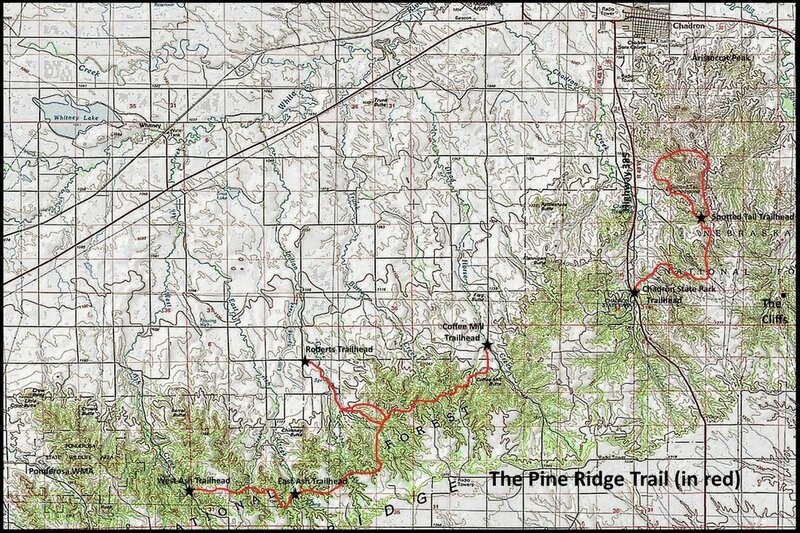 If you want to hike a different route back, continue on to the Pine ridge Trail, go east about 1/4 mile, then back north on the Roberts Trail, which will take you back to the trail junction you started at.